This guy claims that "it's all about confidence". 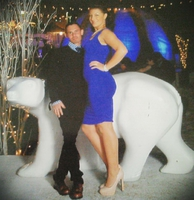 He claims to be 5'5" and he claims his wife is 5'10". She appears to be wearing 5 or 6 inch heels in this photo. That would make her 6'3" - 6'4". That would make him appear to be almost a foot shorter than her. But that doesn't appear to be the case. If she took off those heels, I imagine she would be approximately his height, maybe slightly taller based on his height here compared to hers with those heels on that she's wearing. Take a good look at his legs. They appear to me to be disproportionately longer in relation to his torso than average. Take a look at his feet. He's either standing on his tiptoes resting his heels on the top of the backs of his shoes, or he's wearing height-increase shoes. Talk about lies?? Talk about frauds?? He thinks that most people are too un-observant to catch his little con - and he's right - most people aren't. Certainly none of the r/short idiot brigade have been so far. In my mind this little con makes everything he says suspect, even the part where he claims the woman is his wife. We can't be sure of that either, but just take a look at some of the comments there from some of the usual dupes. None of these characters would ever think to just look at the photo a little bit more closely. I agree that there may be some Hocus Pocus going on here, but it might be even more substantial than just lying about heights and wearing shoe lifts because this entire pic might be a bad Photoshop effort. If you zoom in on the pic, it appears that everything from his left shoulder down to his hip just disappears into her torso. I could be wrong and it could be an optical illusion, but something looks off about the angle at which they both come together. That whole sub has lost its mind posting shirtless pics lately, and of course, trolls, phonies, and smug asses all over Reddit are licking their chops to have some fun at the expense of short guys as the result. The posters of r/short are easily duped, thus, the rest of Reddit(and society in general) will continue to use them as props to be used to garner easy laughs. You know, I think you're right about this being a bad Photoshop effort, the more I look at it. The clearer photo is actually the one on reddit. Take a look at the position of his feet. Who the hell stands with their feet in that position for a photo with their wife? Who stands like that at all?! I challenge anyone to try putting their feet in that position - especially for a photo standing next to someone. It's extremely awkward and uncomfortable. Who would do that?? His legs seem to be about 3 or 4 inches longer than an average man's legs would be for his height! Also, where's his left arm and hand? Wouldn't it be around her waist? Wouldn't we see his left hand? But back to this guy's legs. The only people with legs that long in relation to their torso are people who've had leg-lengthening surgery or Marfan's Syndrome. And we know that since he has so much "confidence" the former is not possible, and the latter is characterized by exceptionally tall height and long fingers and hands, which he doesn't have. You know, I don't consider myself a genius, but the level of stupidity and delusion of the people who post on that sub is just mind-boggling. It's so pathetic.